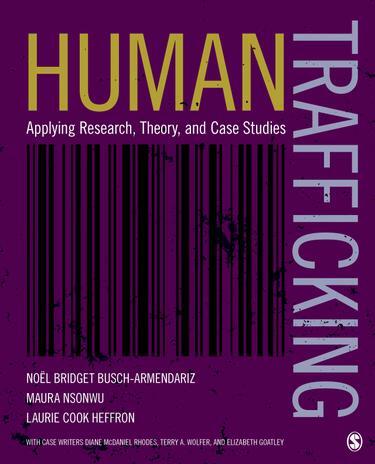 Human Trafficking: Applying Research, Theory, and Case Studies is a practical, interdisciplinary text that draws from empirically grounded scholarship, survivor-centered practices, and an ecological perspective to help readers develop an understanding of the meaning and scope of human trafficking. Throughout the book, authors Noël Bridget Busch-Armendariz , Maura Nsonwu, and Laurie Cook Heffron address the specific vulnerabilities of human trafficking victims, their medical-psycho-social needs, and issues related to direct service delivery. They also address the identification of human trafficking crimes, traffickers, and the impact of this crime on the global economy. Using detailed case studies to illuminate real situations, the book covers national and international anti-trafficking policies, prevention and intervention strategies, promising practices to combat human trafficking, responses of law enforcement and service providers, organizational challenges, and the cost of trafficking to human wellbeing.